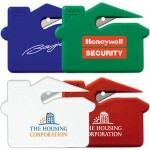 Make an impression with our uniquely shaped promotional letter openers. With your company imprint or logo directly on the front, everyone will see your logo and think about your firm when they use the letter opener. This promotional giveaway can also be used to compliment the theme of a specific event. Also available in a heart shape, book shape or other custom shape.